Sen. Marco Rubio (R-FL) delivers the 2013 State of the Union GOP rebuttal. Iowa senator Joni Ernst’s response to President Obama’s latest State of the Union finally convinced me: it’s time to abolish with State of the Union rebuttal speech for good. That’s not a jab a Senator Ernst. She did as well as anyone in her position has done over the last 30-odd years (this is, at best, a backhanded compliment). Nor is it a partisan jab at Republicans: Democrats haven’t exactly nailed the format, either. And although some individuals have brought their own special brands of failure to prime time, the problem isn’t the individual’s — it’s the event itself. The State of the Union rebuttal is the most thankless job in American politics — although having to certify your own presidential defeat, as Al Gore did in 2001, must be a strong contender. If you draw the short straw, as Ernst did this year — and it must be considered the short straw even if the respondent lobbies for the spot — you will follow the most powerful leader in the world, who just gave a speech in front of a packed house and received between 80 and 100 applauses and standing ovations in front of between 30 and 60 million viewers. You will also probably deliver your speech in a cramped, poorly lit, Victorian-era room, surrounded by a deathly silence that, after all the whoopin’ and hollerin’ of the State of the Union, is simply jarring. If things go just right, no one will remember anything you said an hour later — which is fine because the State of the Union response is not so much a “rebuttal” as a restatement of the vaguest, most generic party talking points. But if you do the wrong thing or come off the wrong way, as judged by our light-speed punditry culture, your failure will live forever. Social media, with its elephantine memory and reverse Midas touch for so many things political, will make sure your failure lives forever. 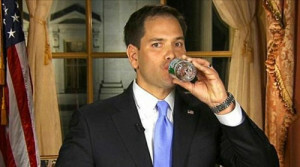 Ask Marco Rubio, whose split second of unbearable thirst will live forever on YouTube. Or Bobby Jindal, whose overwrought folksy charm was instantly — and unflatteringly — compared to 30 Rock’s Kenneth the Page. Even well intentioned efforts to shake up the format, like the Democrats’ infomercial-style, ensemble cast effort hosted by Bill Clinton in 1985, have not aged well at all. The rebuttal speech might be necessary if we were otherwise deprived of the opposition’s (usually low) opinion of the president’s speech without it — but we’re not. From well before the speech until well after, the president’s opponents bombard journalists with fact, stats, and talking points tearing the speech apart. Live-tweeting now affords political junkies and assorted social media users the privilege of experiencing this brutal teardown in real time. If you’re at all interested in hearing everything that was wrong with the president’s speech and how the opposition would do it all so much better, there’s no shortage of opportunities to hear it all and more. The 24-hour news cycle and digital media have rendered the rebuttal utterly unnecessary. In the end, there’s no way for the State of the Union rebuttal to compete with its target. The rebuttal’s stage is small and ephemeral; the State of the Union’s is grand and enduring. The rebuttal’s messenger is often new to the national stage, or hails from the most uncharismatic corners of the opposition party; the person delivering the State of the Union had to win between 40-65 million votes to reach that podium — a pretty good measure of political charisma. Both speeches experience withering scrutiny on social media, but the digital deck is stacked against the rebuttal. It’s a losing proposition for whoever gives the speech: an awful lot of risk for very little reward. So I vote to abolish the rebuttal. I don’t hold much hope that we’ll be rid of it any time soon, but future leaders could put us on the road to abolition by simply refusing the short straw. Previous Article← Time for a digital politics code of ethics?